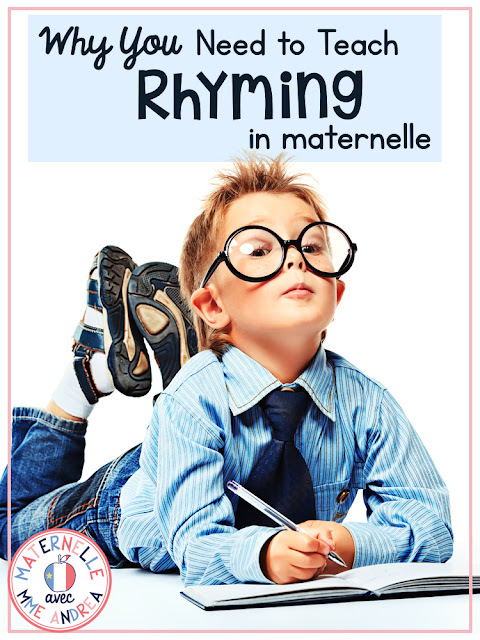 Rhyming is fun, and knowing how to rhyme is very important for anyone wanting to learn to read. Last week, I shared with you how much little Andrea loved to rhyme, and how crazy she drove her parents with The Name Song (along with begging for 100 bedtime stories per night, most of which rhymed). I also explain how (according to a quick Google search - I did not personally do any research/check the validity/sources of this statement), fewer and fewer kids are starting school adept at rhyming, likely because fewer and fewer parents are teaching their children nursery rhymes and reading them lots of rhyme-y bedtime stories. This is a problem for us maternelle teachers! There is a correlation between rhyming mastery and reading readiness, so if we want our students to learn to read (and read well), we have got to make sure that they have rhyming down pat. And, if they aren't learning nursery rhymes at home with their parents at the same rate we did when we were growing up, I think that we teachers should step in and provide them with that opportunity. EVEN IF YOU THINK YOU "AREN'T A GOOD SINGER"!! Sooo many teachers tell me that they "can't sing". 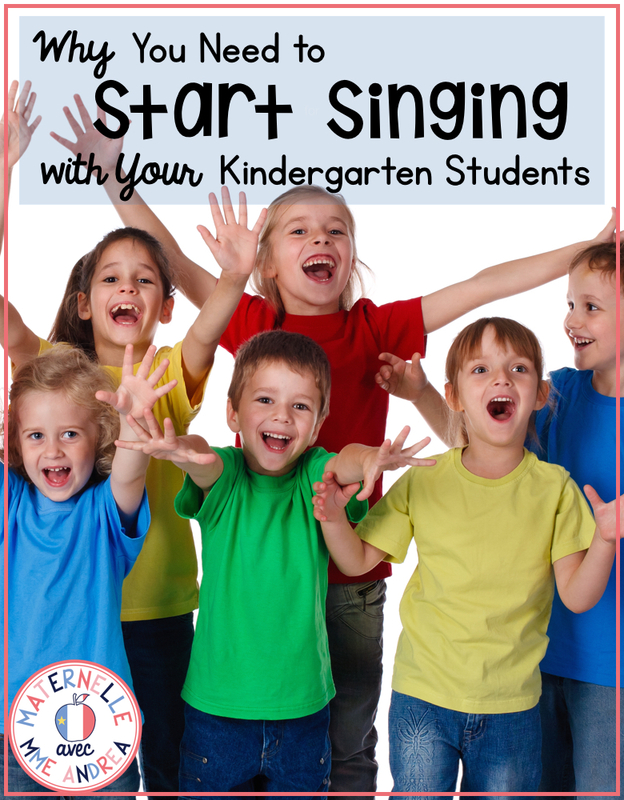 Your kinders don't care, no one else can hear you, and comptines, chansons, and rhyming are WAY TOO IMPORTANT for your students to be missing out on. 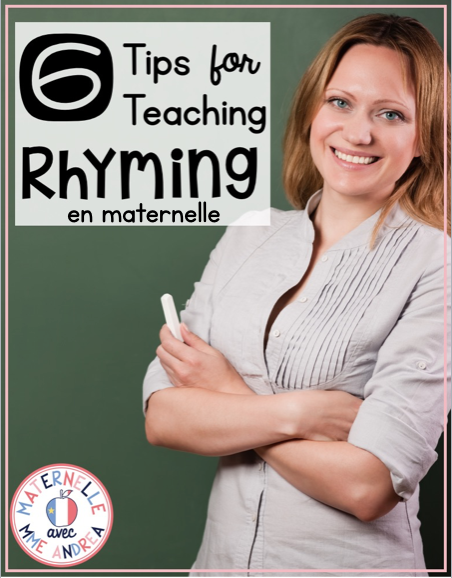 We can teach SO MANY SKILLS via chansons and comptines and the rhythm and rhyme found within them. Teaching five-year-olds to read is super fun, and one of my favourite parts of the job. But, it isn't always easy! Most students catch on to the idea of looking at the picture to help them figure out an unknown word, and many grasp looking at the first letter pretty quickly, too. BUT, struggles can ensue when you ask your students to look at the rest of the letters, and blend the sounds together. My maternelle students can feel really overwhelmed and stressed out when I ask them to "read" a new word. And, finding engaging ways to get my students to practice decoding/blending in French without discouraging them used to be challenging. SO MANY FRENCH WORDS in their books have sons composés or letters that don't even talk! My kiddos would be so excited to come across a short word that they felt they could blend... like auto, for example. They would take a deep breath, look at the word, and say "aaa...uuu...ttttt...ooo... ah-u-to!" And, of course, I had to tell them that no, actually, ah-u-to isn't actually a word, and even though they did correctly blend all of the letters, two of the letters work together to make a magic sound, etc. etc. Frustrating for them, and frustrating for me! I wanted to find a collection of short words where every letter says its sound, that would be easy for them to blend - there are piles of lists like that in English. You know, like cat, hat, pig, pen, etc. etc. But, there aren't actually that many in French. As you probably know, I am anglophone. I grew up speaking English, in an English household, in an English community. I fell in love with the French language in the sixth grade and never looked back, but I was taught completely in English up until grade seven. Everything I was taught about reading, grammar, etc. as a child was in English. Now that I am teaching 5-year-olds en français, I have to be sure I am teaching them the right things. Most things are pretty evident, but not all! English and French have different rules about syllables and when to divide a word into parts/how many parts are in a word. Most of my students come from English-speaking homes as well, so I wanted to be sure I understood the rules correctly before trying to teach them. And, it seems like not everyone is exactly clear on the rules for dividing words into syllables - even different resources/blog posts/etc say different things! But guys, I LOVE rules, so I had to figure out exactly what French syllable rules are. 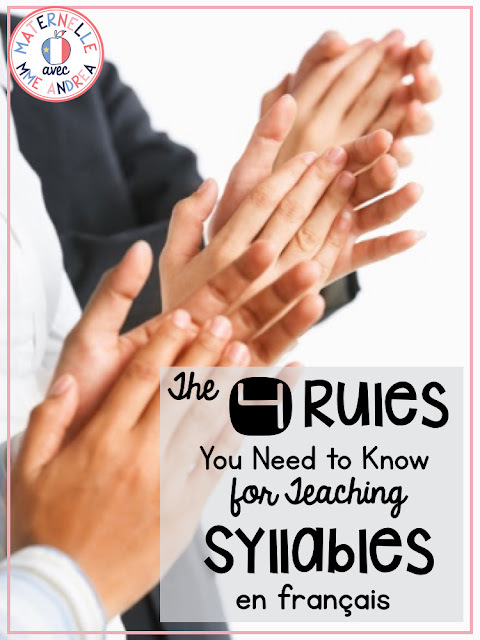 I did quite a bit of investigating on syllable rules and figured I might as well share them with you on my blog, so you maybe won't have to spend as much time as I did trying to figure it all out! Has this ever happened to you in maternelle? It's September, and your kindergarten students know pretty much nothing about being in school. You're bustling about trying to teach them how to properly use scissors and open their lunch boxes... forget about learning to read and write! 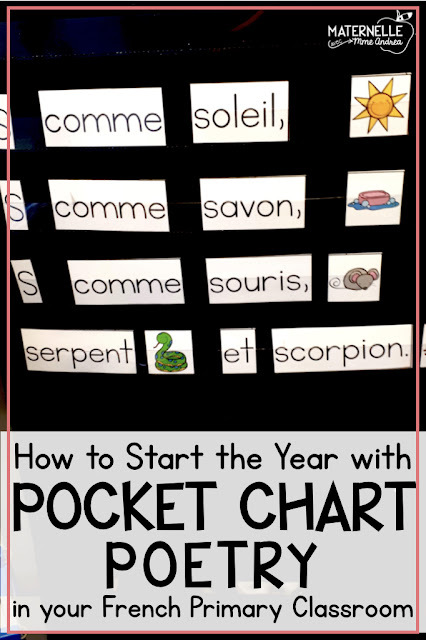 At the beginning of the year in maternelle, it can feel like you are putting out fires and running around like a chicken with its head cut off. Our main goal is to keep everyone happy, alive, and in one piece! I've always struggled with letting go of the idea of jumping right into learning. We have so much to cover, and so little time! Plus, what in the world do you even DO with these 20 five-year-olds if you don't start teaching right away?! I don't like wasting time. Spending all of September and October learning how to walk in a line and use a glue sponge can feel like a waste of time sometimes, even though I *know* it's an important and crucial investment. But man, sometimes, I just want to TEACH!! This year, I snuck something new into our September/October routine, and it helped us out a lot. This new activity helped my students pick up on some important academic skills while also learning about our routine and my expectations, so I felt like I was doing my job... and my students were building the foundation they needed for the rest of the year (behaviour-wise AND academically). Curious about what I did differently this September?